titled Royal Proclamation 1763, to keep secure His trade with the referred to tribe(s) and Nation(s) on the titled North America upon pain of His Displeasure His Loyal Subjects were to put up securities and obtain His licenses to be issued, and His regulation(s) enforced by His Loyal sworn Officer(s) to conduct any trade and commerce with the tribes or Nation(s) of Indian(s). And said licenses and sureties to be revoked upon refusal to compliance of His Majesty’s regulations. And further His Loyal sworn Officer(s) are not to conduct trade or commerce with the tribe(s) or Nation(s) of Indian(s). And further are not to molest or interfere with the said Indian(s) Heritage, customs, usage or occupy their Territories, and if they have, to remove themselves immediately, and further, no Governor or Commander in Chief by discretion upon any pretence whatever to grant warrants of survey or pass any patents upon any lands whatever reserved to the said Indian(s) or any of them or the said Indian(s) Territories. 6. I am kisikawpimootewin and claim my right(s) to my Heritage, custom(s), usage and unmolested freely chosen mode(s) of life as head of my family in the house of the bear clan on miskanahkministik. 8. I am kisikawpimootewin and claim my right(s) as a Signatory, Heir, Successor and beneficiary of a separate and distinct Indigenous Peoples that accepted the contract of ratification warranted by certificate dated 2nd of April, 1879 binding Her Majesty’s Loyal sworn Officers for Her Majesty’s honour and dignity to obey, uphold and fulfill Her Majesty’s obligations and Proclamations, as trustee, to the Treaties, made by adhesion, with the signatory kisikawpimootewin and His separate and distinct Indigenous Peoples, the 18th day of September, 1878. 9. 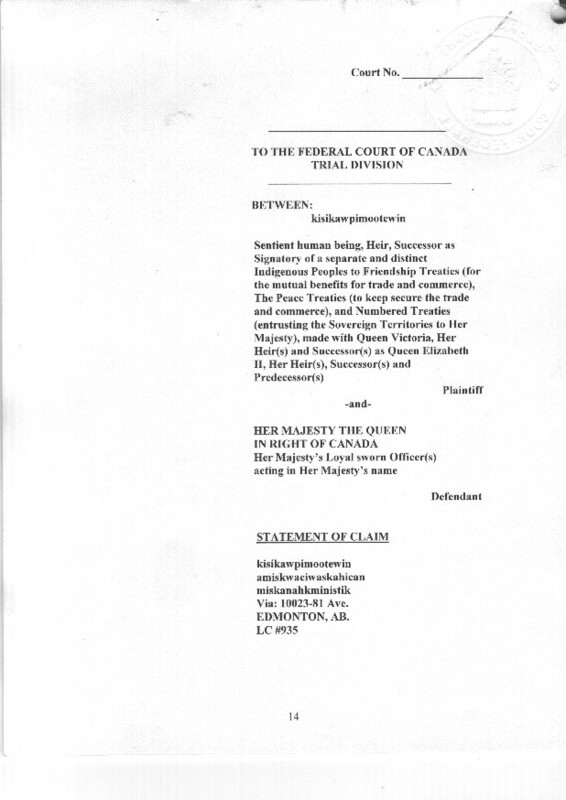 Dated the 13th day of May, 2004 kisikawpimootewin by petition to Her Majesty’s Loyal sworn Officer(s) acting in Her Majesty’s name for the Trust Territories titled Canada, titled Queen’s Privy Council for Canada, to fulfill the terms of contract of ratification, and order For Her Majesty’s Honor and Dignity, Her Majesty’s Loyal sworn Officer(s) acting in Her Majesty’s name, for the Trust Territories titled Canada, to obey and uphold Her Majesty’s Law and Treaties made with the signatory kisikawpimootewin of the separate and distinct Indigenous Peoples, by adhesion, the 18th day of September 1878 and comply with terms of contract of ratification, 2nd of April 1879. 10. 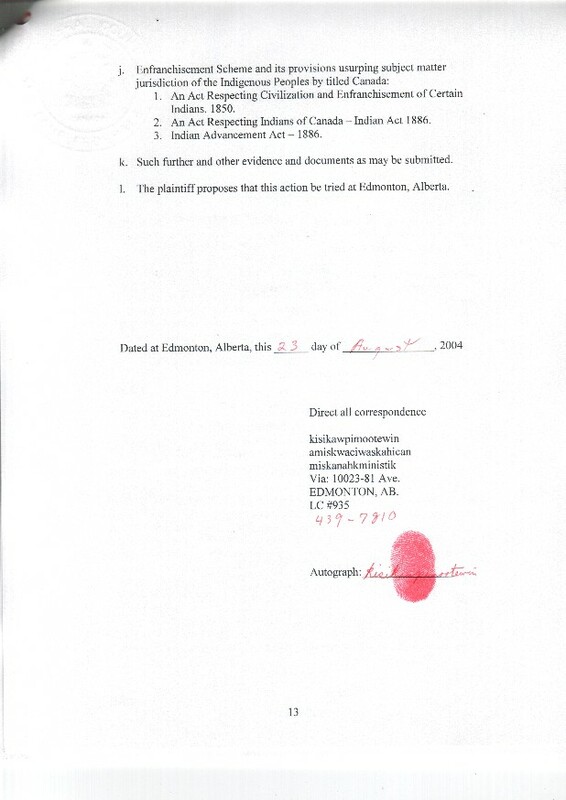 Dated the 20th day of May, 2004 kisikawpimootewin by TAKE NOTICE of intention to seek remedies in the court to Her Majesty’s titled Queen’s Privy Council for Canada for failure by refusal in breach to fulfill the terms of the contract of ratification warranted by certificate dated 2nd of April 1879, and further failure as refusal for Her Majesty’s Honor and Dignity in dereliction of their sworn duty to Her Majesty to order Her Majesty’s Loyal sworn Officer(s) acting in Her Majesty’s name for the Trust Territories titled Canada, to obey and uphold Her Majesty’s Law and Treaties made with the separate and distinct Indigenous Peoples by action or lack thereof committing treason against Her Majesty’s Queen Elizabeth II, Her Heir(s), Successor(s) and Predecessor(s). 11. Dated the 26th day of May, 2004 Her Majesty’s Loyal sworn Officer(s) acting in Her Majesty’s name for the Trust Territories titled Canada, of the title GOVERNMENT OF CANADA, upon pretence of the usurped subject matter jurisdiction of the separate and distinct Indigenous Peoples by the fraud and scheme of enfranchisement and its provisions by Her Majesty’s Loyal sworn Officer’(s) acting in Her Majesty’s name for the Trust Territories titled Canada, refused in breach to fulfill the terms of the contract of ratification, warranted by certificate made with the signatory kisikawpimootewin of the separate and distinct Indigenous Peoples dated 2nd of April 1879, and refused for Her Majesty’s Honor and Dignity in dereliction of their sworn duty to Her Majesty, to obey and uphold Her Majesty’s Law and Treaties made with the separate and distinct Indigenous Peoples, and further, refusal to Obey and uphold Her Majesty’s Law, Orders for the repeal and removal of the usurped subject matter jurisdiction by the scheme of enfranchisement and its provisions by the titled CANADA, by action(s), or lack thereof committing treason against Her Majesty Queen Elizabeth II, Her Heir(s), Successor(s) and Predecessor(s). 12. The Defendant, acting in Her Majesty’s name, knowingly and willingly with intent have and continue to conspire, one with the other and other(s) unknown, by action(s) and refusal(s) in dereliction of their sworn duty to Her Majesty, and for Her Majesty’s Honor and Dignity to obey and uphold Her Majesty’s Proclaimed Royal Will and Pleasure for Her Majesty’s Treaties and Proclamations made by adhesion with the Plaintiff the 18th day of September 1878, the contract of ratification dated the 2nd Day of April 1879 made with the Plaintiff and the Defendant and Her Majesty’s Proclamations, that the usurped subject matter jurisdiction by the titled Canada of the separate and distinct Indigenous Peoples by enfranchisement and its provision(s) by the defendant acting in Her Majesty’s name, is to be repealed and its provisions to be removed dated Friday 28th June 28, 1985. 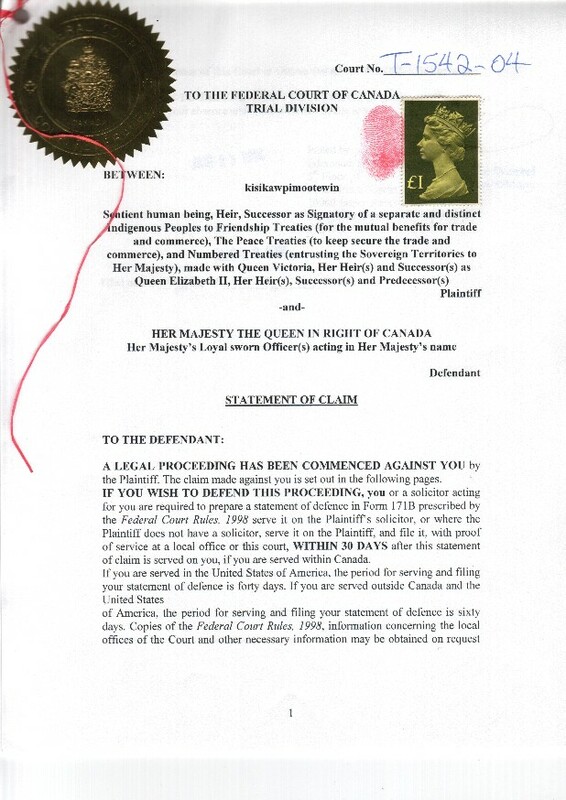 The Defendant acting in Her Majesty’s name, refuses in contempt of rulings on the COURT RECORD, the 4th day of December 1997 that the Plaintiff has lawful standing and claim of right(s). Her Majesty’s Treaties and Proclamation(s) made by adhesion with the Plaintiff the 18th day of September 1878. Unmolested Heritage, customs, usage and freely chosen mode(s) of life. 2nd day of April 1879. General of Canada dated November 5th 1999. Plaintiff to comply to its regulations, licenses, fees and fines. The Defendant acting in Her Majesty’s name, by actions are in contravention and in breach of International Law of the United Nations conventions of human rights, within sections of crimes against humanity, by genocide and hate propaganda for continuance to molest injure, violate and deprive the Plaintiff of his rights, Heritage, customs, usage and freely chosen modes of life. 13. Her Majesty’s Loyal sworn Officer(s) acting in Her Majesty’s name for the trust territories titled Canada, upon pretense of order and good government, and of immunity, by ordered abolishment of Her Majesty’s Law, Petition Of Right 1627, Petition Of Right Act 1860 UK, Petition Of Right Act Canada 1875, S.C. 1875, c. 12., Petition of Right Act, 1876, S.C. 1876, c. 27. And refuse in dereliction of their sworn duty to Her Majesty to obey, uphold and enforce Her Majesty’s Proclaimed Royal Will and Pleasure, Law and orders that the usurped subject matter jurisdiction of the separate and distinct Indigenous Peoples by enfranchisement and its provisions, by Her Majesty’s Loyal sworn Officer(s) acting in Her Majesty’s Name for the Trust Territories titled Canada, to be repealed and removed, the 28th day of June 1985.
refusals upon pretence and fraud of the usurped subject matter jurisdiction of the separate and distinct Indigenous Peoples by the fraud and scheme of enfranchisement and its provisions, by Her Majesty’s Loyal sworn Officer(s) acting in Her Majesty’s name for the trust territories titled Canada, refuse to obey and uphold Her Majesty’s Internationally recognized Treaties made with the separate and distinct Indigenous Peoples. And further refusals to obey and uphold Her Majesty’s treaties made by adhesion with the signatory kisikawpimootewin of a separate and distinct Indigenous People, the 18th day of September 1878.
by actions and refusals have tainted Her Majesty’s honor, dignity, character and credibility, placing the administration of justice for her Majesty’s, Proclaimed Royal Will and Pleasure, Law, Treaties, the supreme law for Her Majesty’s Trust Territories titled Canada, in a state of disrepute, and by refusals actions or lack thereof upon pretence of fraud are committing, with conspired, intent, knowledge and forethought actions and acts of treason against Her Majesty Queen Elizabeth II, Her Heir(s), Successor(s) and Predecessor(s). a. Royal Proclamation of King George III, October 7, 1763.
b. Genealogy of kisikawpimootewin compiled and certified by titled Canada. c. Her Majesty’s treaty made by adhesion on the 18th day of September 1878 with the Signatory kisikawpimootewin. d. Contract of ratification dated 2nd April 1879 made by Her Majesty’s Loyal sworn Officer(s) for the trust territory titled Canada with the Signatory kisikawpimootewin. 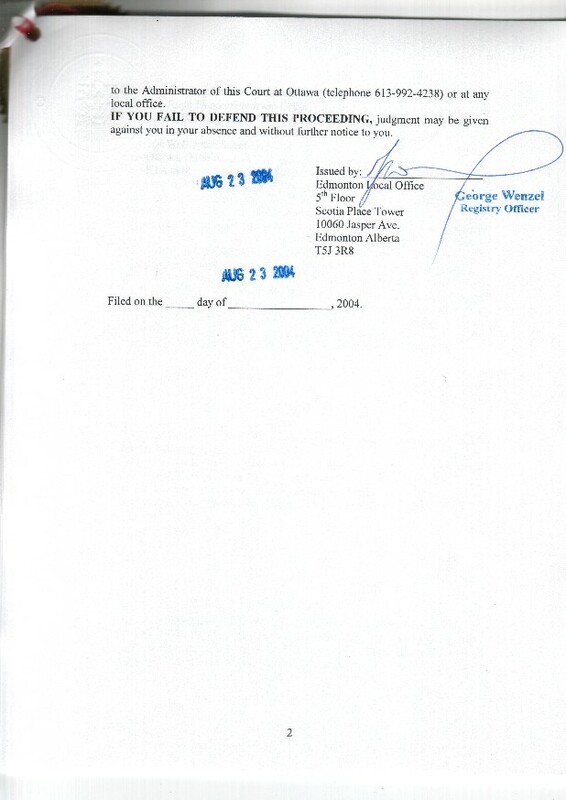 f. Rulings on Court Record dated 4th day of December 1997 re: “Kaffir” project and trial, for lawful standing and rights of the Signatory kisikawpimootewin. g. The Treaties of Canada with the Indians - Alexander Morris. h. Petition of kisikawpimootewin to Her Majesty’s Loyal sworn Officer(s) acting in Her Majesty’s name titled the Queens Privy Council for Canada, requesting for Her Majesty’s honour and dignity, to uphold and fulfill the terms of the contract of ratification made with the signatory kisikawpimootewin dated 2nd April 1879. And refusal in breach and in dereliction of their sworn duty to Her Majesty. i. An Act for the protection of the Indians in Upper Canada from imposition, and the property occupied or enjoyed by them from trespass and injury. 10th August 1850. An Act for the better protection of the Lands and Property of the Indians in Lower Canada. 10th August 1850.